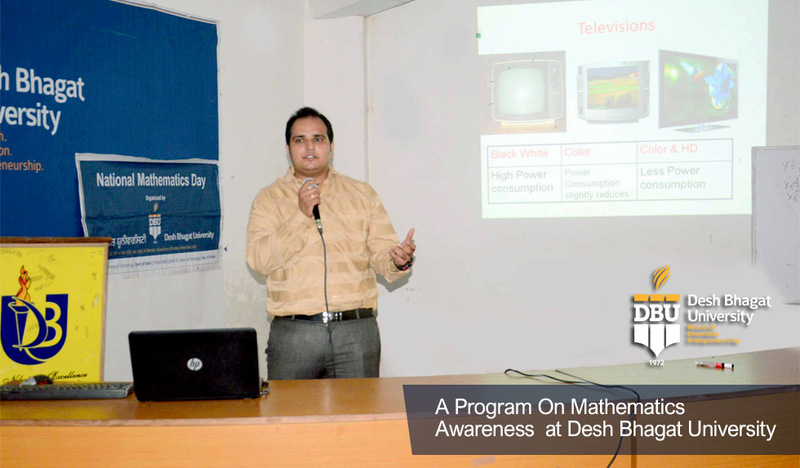 As part of Mathematics Awareness Month Celebrations, in best universities in Punjab and North India, Desh Bhagat University celebrated National Mathematics Day. The event was sponsored by Punjab State Council for Science and Technology (PSCST). The Experts of the day were Er. Nitin from Patiala and Mr. Vishal from Pushpa Gujral Science City. Students and staff members from Faculty of Engineering, Agriculture Courses & Applied Sciences participated in it. The event was inaugurated by the university Chancellor Dr. Zora Singh. 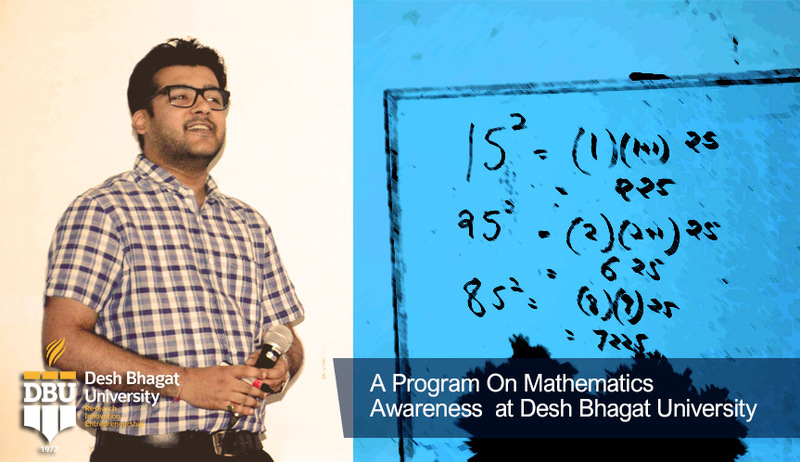 He said that objective of the event is to teach the students about the various facets of mathematics in daily life. Vice Chancellor Dr. Virinder Singh highlighted that Indian history reflects back the origin of great scientists and mathematicians. Pro Vice Chancellor Dr. Neelima Jerath gave a brief introduction about the day. She highlighted that digit 0 (Zero) is invented by the Indians though the history of mathematics dates back to Babylonian and Mayan civilization also, besides Indian civilization. She brought out that mathematics provided the base of many scientific branches. In first session, Mr. Nitin, an expert in Vedic Mathematics informed the students that Vedic Mathematics was useful in development of mind in order to achieve the goals in life. He explained how complex additions, square of a numbers etc. can be done within a second by applying the basics of Vedic mathematics. In the second session Mr. Vishal from Pushpa Gujral Science city presented his talk on “Thinking out of box for sustainable development”. He presented case studies on inventions by school students and how necessity becomes the mother of invention. He also motivated the students to be part of inventions and innovations. Pro Chancellor Dr. Tajinder Kaur informed that such events to overcome phobia of mathematics should be regularly conducted in the university. Dr. H. K. Sidhu and Dr. Ruchi proposed vote of thanks and appreciated the learned speakers for their valuable thoughts and suggestions. Er. Arshdeep Singh, Er. Amritpal Singh were also present at the occasion.